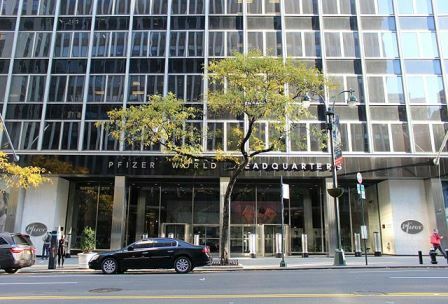 Pfizer and Eli Lilly have announced positive top-line results from a phase 3 study evaluating tanezumab 2.5 mg or 5 mg in patients with moderate-to-severe osteoarthritis (OA) pain. The tanezumab 5 mg treatment arm met all three co-primary endpoints at 24 weeks, demonstrating a statistically significant improvement in pain, physical function and the patients’ overall assessment of their OA compared to those receiving placebo. The tanezumab 2.5 mg treatment arm met two of the three protocol-defined co-primary efficacy endpoints compared to placebo, demonstrating a statistically significant improvement in pain and physical function, while patients’ overall assessment of their OA was not statistically different than placebo. Tanezumab is a humanized monoclonal antibody that is part of an investigational class of non-opioid pain medications known as nerve growth factor (NGF) inhibitors. In this study, subcutaneous (SC) administration of tanezumab 2.5 mg or 5 mg was evaluated every eight weeks, for a total of 24 weeks, in patients with moderate-to-severe OA pain. Patients enrolled in the study had experienced inadequate pain relief from or intolerance to at least three different classes of analgesics, and on average had OA for more than six years. They also reported significant impact of their pain on their ability to function in everyday life. Preliminary safety data showed that tanezumab was generally well tolerated during the 24-week treatment period, with similarly low rates of treatment discontinuations due to adverse events observed among patients taking tanezumab and placebo. The trial also included a 24-week safety follow-up period, for a total of 48 weeks of observation. Overall, rapidly progressive osteoarthritis (RPOA) was observed in 2.1 percent of tanezumab-treated patients and was not observed in the placebo arm. The ratio of RPOA type 1 (accelerated joint space narrowing) to RPOA type 2 (damage or deterioration of the joint) was 2:1, consistent with the ratio from the previously reported SC Phase 3 study in OA pain (A4091056). There was one event of osteonecrosis and one event of subchondral insufficiency fracture observed in tanezumab-treated patients, and no events were observed in the placebo arm. The rate of total joint replacement was similar across the tanezumab treatment groups and placebo. Detailed efficacy and safety results from this study will be submitted to a future medical congress. More than 27 million Americans are living with OA, a progressive joint disease that can be life-altering and cause debilitating physical, emotional and social effects. Approximately 11 million of these patients suffer from moderate-to-severe OA pain. Currently available treatment options for OA pain do not meet the needs of all patients, and many cycle through multiple therapies to find relief from their pain. Tanezumab has a novel mechanism that acts in a different manner than other analgesics, including opioids and nonsteroidal anti-inflammatory drugs (NSAIDs), and in studies to date, tanezumab has not demonstrated a risk of addiction, misuse or dependence. This is the second readout from the ongoing Phase 3 global clinical development program for tanezumab, which includes six studies in approximately 7,000 patients with OA pain, chronic low back pain (CLBP) and cancer pain (due to bone metastases). Results from the first Phase 3 OA study (A4091056) evaluating SC administration of tanezumab for 16 weeks were previously reported. That study met all three co-primary efficacy endpoints, demonstrating that among patients with moderate-to-severe OA pain of the knee or hip, both dosing regimens of tanezumab (2.5 mg and 2.5/5 mg) resulted in a statistically significant improvement in pain, physical function and patients’ overall assessment of their OA, compared to placebo. The Phase 3 OA study (A4091057) was a randomized, double-blind, placebo-controlled, multicenter, parallel-group trial evaluating the efficacy and safety of SC tanezumab compared to placebo for 24 weeks in patients with moderate-to-severe OA pain of the knee or hip. The trial was conducted in Europe and Japan. Patients enrolled in the study had experienced inadequate pain relief from or intolerance to at least three different classes of analgesics, and on average had OA for more than six years. At the beginning of the study, they reported significant impact of their pain on their ability to function in everyday life. A total of 849 patients were randomized to three treatment groups in a 1:1:1 ratio to receive three SC injections over the 24-week treatment period, once every eight weeks. One group received three doses of tanezumab 2.5 mg, the second group received three doses of tanezumab 5 mg, and the third group received three doses of placebo. The efficacy of tanezumab versus placebo was measured by changes from baseline at 24 weeks in the Western Ontario and McMaster Universities Osteoarthritis Index (WOMAC) Pain subscale, the WOMAC Physical Function subscale, and the patient’s Global Assessment of OA. The trial also included a 24-week safety follow-up period. Tanezumab is an investigational humanized monoclonal antibody that works by selectively targeting, binding to and inhibiting NGF. NGF levels increase in the body as a result of injury, inflammation or in chronic pain states. By inhibiting NGF, tanezumab may help to keep pain signals produced by muscles, skin and organs from reaching the spinal cord and brain. Tanezumab has a novel mechanism that acts in a different manner than opioids and other analgesics, including NSAIDs, and in studies to date, tanezumab has not demonstrated a risk of addiction, misuse or dependence. In 2013, Pfizer and Lilly entered into a worldwide co-development and co-commercialization agreement for the advancement of tanezumab. In June 2017, Pfizer and Lilly announced that the U.S. Food and Drug Administration (FDA) granted Fast Track designation for tanezumab for the treatment of OA pain and CLBP. Tanezumab is the first NGF inhibitor to receive Fast Track designation, a process designed to facilitate the development and expedite the review of new therapies that treat serious conditions and fill unmet medical needs. If approved, tanezumab would be a first-in-class treatment for OA pain and CLBP.